Welcome to the Mother Lode River Center! Our newly expanded 20-acre riverside camp is intended to provide ambiance and charm that will make a lasting impression. We are located 60 mins east of downtown Sacramento along the American River. There are a variety of different accommodation options to ranging from campsites to a river cottage, all within a stones throw to river. 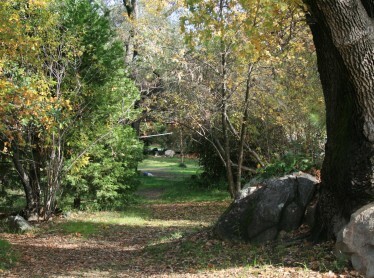 Our camp is quiet, nature based and available only to guests who participant in an activity with Mother Lode. 20 riverside acres with one half mile of riverfront with multiple charming eddies all connected by our nature trail. Healthy, delicious meals served from our complete commercial kitchens. On site Challenge Ropes Course: Nowhere else on the West Coast can you combine zipping, team building and group activities with rafting like you can at MaLode! Multiple groups, want to separate girls from boys, on your honeymoon and want to be all by yourself? It is all easily accommodated! The “Main Lode” camp and the “Retreat Center” each have 10 platform canvas tent cabins apiece. These are artfully sited with plenty of space between each tent. Cots and foam mattresses are available for your comfort. The Main and Retreat Center camps each have separate bathroom facilities with hot showers, flush toilets and changing areas. Both camps have complete commercial kitchens where we prepare group meals. Stone campfire rings are provided near the river. 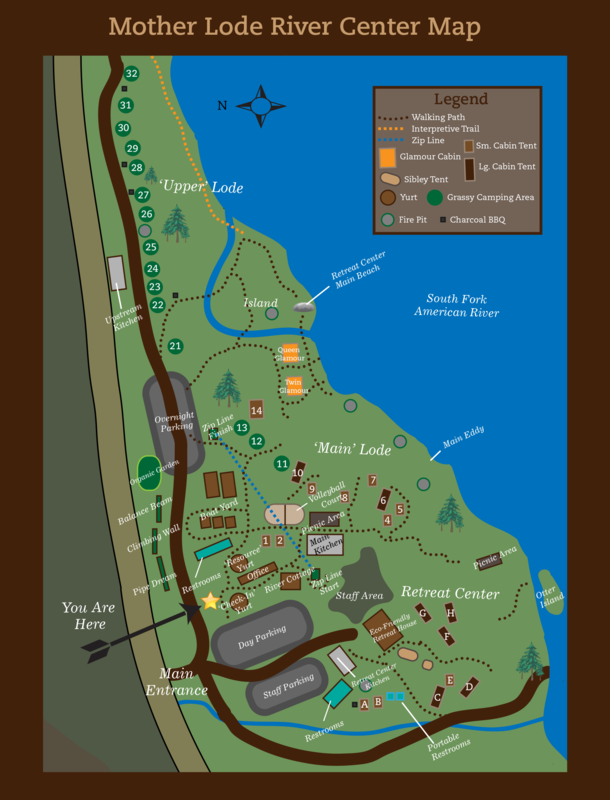 The “Glamour Cabin” platform tents with beds, furniture and private riverside sites are features of Main Lode located upstream of the main beach area (colored orange on the map). “Upper Lode” (sites 21- 32) is easily car accessible and features our most popular camping site, “The Island” accessible by a stone footpath and bridge. 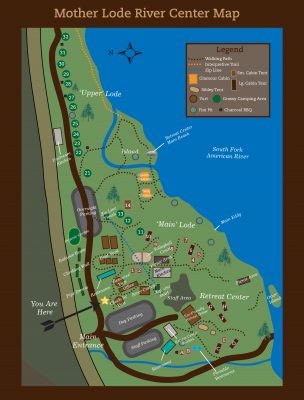 Further upstream is more car accessible camping as well as a full “wilderness kitchen” with hot and cold running water, sinks, refrigeration and stoves which are all available for rent to Scouts and other responsible groups who don’t want to haul everything with them. Our charming one bedroom, one bath River Cabin has A/C, heat and a full kitchen. Our 2 bedroom, 2 bath Eco-house has all the above, plus solar power, patio with BBQ. Meeting Space: Two 20-foot in diameter yurts provide indoor space for meetings, yoga, meditation and group sleeping for youth. Each is located near a bathroom for your convenience. Camp Store: Our “greeting yurt” houses our check in, photo area and camp store for those last minute items such as Chums, a disposable waterproof camera, even sleeping bags if you forgot yours or just flew in from out of town. Mother Lode River Center’s facility is available exclusively to guests participating in one of our activities or educational programs.